Bulletin IV of the Hebrew Battalion of the infantry corps, published in honor of two years of activity. Great Britain, 27/12/1942. Stencil print with illustrations by Nachum Gutman. Rare. From the introductory words by Commander M. Cohen: "We, the first battalion of the Palestine regiment, today celebrate two years since our establishment ... from now on we will be the first company of the first Palestine regiment ... When the day of reckoning comes, we will show the enemy with our actions that the brave spirit of our fathers' fathers does not just dwell among us, but this spirit stimulates new strengths within us, capable of overcoming every difficulty and obstacle, in our way - the way of the first Hebrew battalion." The booklet contains articles about the foundation of the battalion, "The Image of the Hebrew Warrior," and its future goals. 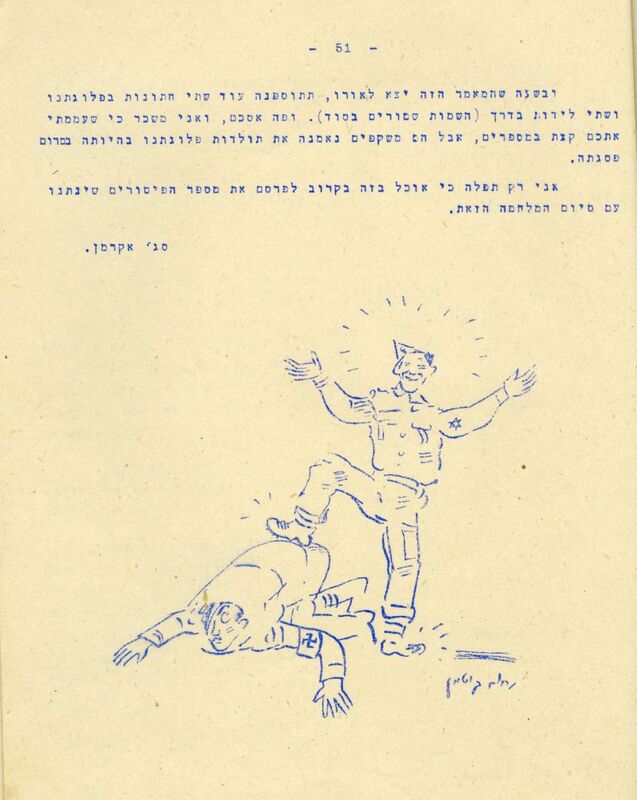 Illustrations by Nachum Gutman include an interesting illustration showing a Jewish soldier trampling an SS soldier under his feet. Including a blessing from Berl Katznelson, "Praise be to the good day of your company ... and our victory will come only when we succeed in expelling the exile from everywhere." An article by Eliyahu Golomb on the inauguration of the first Jewish battalion, and more. And more. 56 pages. Printed on double leaves. Fine condition.